My partners (Emily Kwok and Hannette Staack) and I run a business called Groundswell Grappling Concepts. In 2009, we started hosting grappling camps for women, because back then, there were few opportunities for women to train together. Those ladies who were committed to improving our jiu-jitsu had to be content with training with men. The first time we convened thirty women in the same room at the same time, everyone felt how momentous it was. 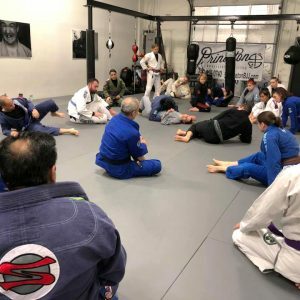 We developed a good reputation, primarily by doing our level best to provide high quality jiu-jitsu instruction/training and make meaningful connections with the people who attended our events. Over time, we started to be able to articulate our values and priorities and incorporate those into our events, paying forward some of what we had received from our own instructors and training partners. We refined our leadership and teaching skills and remained committed to expanding our self-awareness, as individuals and as a business. We started to host co-ed events, on the basis of feedback suggesting that men wanted to participate in the jiu-jitsu experiences we had created as well. The feedback was right. We got interest from male grapplers as well as female ones, and now co-ed events are a regular part of our rotation. 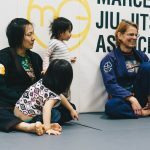 I could go into a lot of detail about what I think makes our camps unique, and I could include things like the many world-class guest instructors we have had the opportunity to host, and the different types of sessions we offer, including nutrition, life coaching, and at this most recent camp, which we held at Princeton BJJ, a Wim Hof session. But that would sound like an infomercial. And anyway, especially after this most recent camp, I’m pretty sure I can sum up what we provide in one word: community. Most of the people who attend our camps are happy with their training situations. They have a satisfying local community within the walls of their schools, and they do not really lack for much on a day-to-day basis. That being said, I believe there is no such thing as too many good influences or too many opportunities to learn from skilled practitioners who are also people of integrity. 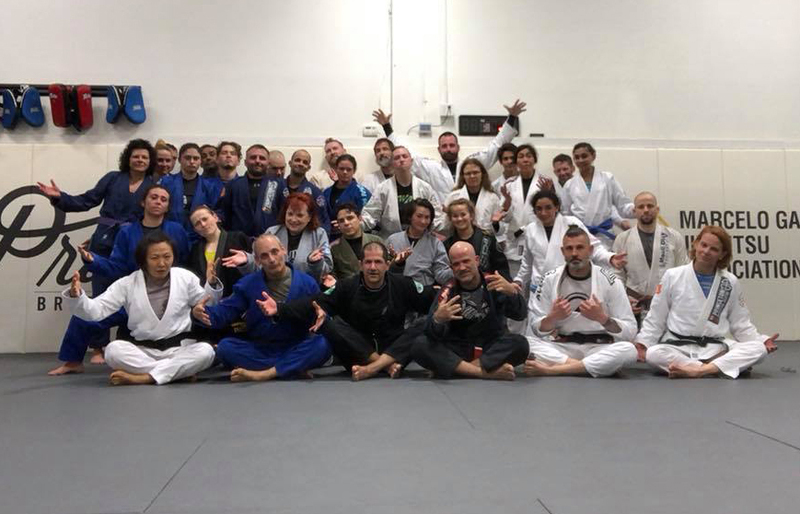 At this stage of my jiu-jitsu career, I have had the opportunity to meet, train with, and learn from many such people who do not train at the same place I regularly do. Rather, they are creating excellence and good will in addition to jiu-jitsu badassery in their corners of the jiu-jitsu world. In my experience, then, there is something to be said for the broader jiu-jitsu community and our capacity to engage in and contribute to it. We must have a safe, challenging place to train every day. But we can also be helped by having a connection to the broader world of jiu-jitsu—and how jiu-jitsu connects to the rest of the world–whether, whether via neighbors, instructionals, competition, open mats, seminars, camps like GGC’s, or random encounters in the supermarket when one person in the produce section notices the cauliflower ear of another person walking toward the cereal aisle. At the GGC event, we had the opportunity to share some of our broader community with the campers, and we are grateful that they trusted us enough to welcome these people into their own. Being self-aware. Does drama follow you everywhere you go? 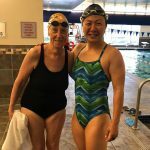 Do you have a problem finding people who are willing to train with you? If the answer to these two questions is “yes,” consider why that might be and resolve to address it so you can make positive contributions to your community/(ies). Identifying what we value and are looking for in our training and our lives and finding events and people that align with those values. Not every event is going to speak to us, but that can provide useful information that can help us identify what—and who—does. Asking those we trust (e.g., instructors, training partners) who they admire. Why do these people pass the smell test, both technique-wise and integrity-wise? What do they have in common? Supporting the people in our community(ies). This can mean many things: cheering our teammates on at tournaments, inviting people we respect and admire to visit our academies (and compensating them appropriately), communicating clearly with our training partners, reposting events run by people we respect and admire. It also means taking a stand when someone or something threatens the integrity of our community(ies). What and who do you value in your jiu-jitsu community(ies)? Post your observations to comments. I was part of a great community at my old gym. Over the years the owners got greedy and started aiming for bigger and bigger things, forgetting about the existing members. The community that used to be great, started dying. It was even worse for the instructors, who were not allowed to teach anywhere else or participate in events organised by other gyms. Sure, it’s a business and you don’t want your employees working for the competition. But in a small town like mine if you can’t pay your instructors the legal minimum wage, you should support them by allowing them to work for other gyms. Current gym has a very open policy, welcoming everybody on their mats and allowing instructors to teach where ever they want. Also better services for the existing customers, never taking away anything to make room for new things.